I live in the 13th district and to tell you the truth there aren’t so many restaurants for my taste in this area, but there is Pozsonyi Kisvendéglő which is a beloved spot for most of us. Some people come for the food while others come for the atmosphere. For me it is not about the food, if I want to be honest with you, I always ask for the most simple one-course dishes, it is more about the loose spirit at the restaurant. 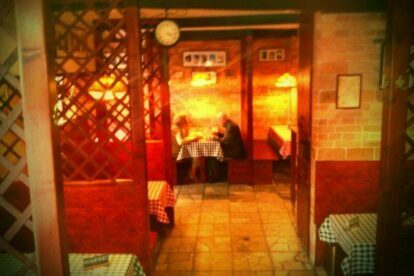 Imagine a simple, friendly and loud Hungarian restaurant. The place is always full, it is a goddamn miracle if you easily get a free table there. The portions are huge, the prices are cheap. The restaurant is located in Pozsonyi Street, which became a half pedestrian area. A pleasant and peaceful street, full of little shops, trees and walking couples. It is a pleasure in summertime to sit on the restaurant’s terrace and spend your afternoon there. My tips: first of all make a reservation, take your friends, do not go there for culinary pleasure, the offer on the menu is quite big, but I advise you to order a simple Hungarian dish (chowder is recommended), your meal will arrive in a very short time, eat, enjoy, digest!